There are few things more delicious than having a book that you don't want to put down, one that is satisfying and leaves a good after-taste in your mouth. 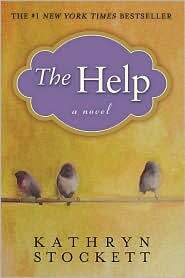 One of my best friends recommended "The Help" and if you haven't already read it, this is the perfect summer book. I originally thought the book had something to do with someone needing help, am I intuitive or what? But instantly after beginning the book the light turned on and I remembered my mother always referring to their housekeeper as "help." She would say something like "oh yes, we all had help growing up." And that is just what this book is about, African American women working in white women's homes in the south. It is a book that will ignite all of kinds of emotions: happiness, anger, frustration, outrage and joy. Once you start it, you won't want to put it down. I just devoured this book. Could not put it down! Let's discuss. I was so sad for it to end! I would have read 800 more pages. I am just about to start "The Girl Who Played with Fire," it is the sequel to "The Girl with the Dragon Tattoo." Have you read those? I don't normally like thrillers, but this first one I couldn't put down! Since you are from the south and I am dying to know how it really was: did your mom remember it the way it is described in the book? what does she think about all that now?